Among America's most complex planning environments, Indian country continues to face innumerable challenges to its community development. These factors are historic in nature, creating an assemblage of complex problems in reservation land management, policy implementation, and the ability of tribes to access capital for community investment.This study explores the history and the land, population, economic, and housing characteristics of Indian country. The authors' investigation includes: reservations, Alaska Native villages, and other Census-recognized areas of historical Native American settlement and tribal culture. They analyze the constraints to housing and economic development and develop strategies for addressing those constraints. This book also identifies, uses, and evaluates data sources relevant to the study of housing and economic development on tribal lands. 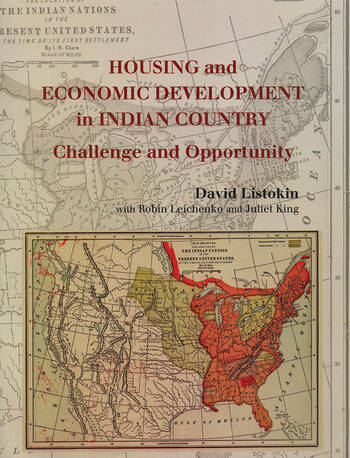 The research in this book was funded by the Fannie Mae Foundation.In the Journal of the American Planning Association, Nicholas C. Zaferatos wrote that Housing and Economic Development in Indian Country is an essential desk reference for policymakers and planners working in Native American communities, as well as for nontribal agencies and other planners who share a concern for the well-being of tribal nations. It also contains extensive appendices in an accompanying CD containing data for individual tribal areas.